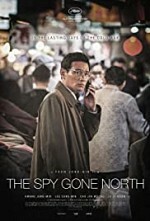 Watch The Spy Gone North: In 1993, former military officer Suk-young Park is recruited as a spy by South Korea's National Intelligence Service, and given the code name "Black Venus". He is then sent to infiltrate a group of high-ranking North Korean officials based in Beijing, with the ultimate goal of acquiring information on the North's nuclear program. After becoming close to Myong-un Ri, a key power broker, Black Venus succeeds beyond his wildest dreams of gaining the trust of North Korea's leadership. But political machinations on both sides of the border threaten to derail his accomplishments.